Brown’s experience was mostly in French cooking while Le held vast knowledge of Asia’s gastronomic diaspora — Vietnamese heritage, Korean upbringing, training in Japanese cuisine. Within months, the pair had teamed up and started a new concept: EAV’s Octopus Bar. Perhaps the only place in Atlanta where you can order a plate of Banger Island mussels at 2 a.m., the industry haunt gained quick critical acclaim. Brown and Le returned to full-scale dining three years later with another joint venture, the seafood-forward Lusca in Buckhead. But despite national recognition from the likes of James Beard and GQ, Lusca shuttered in February, less than two years after it opened. That’s when Skip Engelbrecht, owner of Paris on Ponce, entered the picture. A loyal fan of Octopus Bar, he approached Brown and Le with a proposition: Would they like to open a new restaurant inside his sprawling Ponce de Leon antique emporium? Yes. AMA, named for the pearl-diving sea women of Japanese antiquity, will be a grilled seafood and raw bar concept, similar to Lusca but smaller and simpler, with a patio perched beside the Beltline’s Eastside Trail and sweeping views of Ponce City Market and the skyline beyond. Partners Brown, Le, Engelbrecht, and Jeff Jurgena are aiming for a spring 2017 open, but there’s no rush. 8ARM has them occupied for the time being. So he opened 8ARM for dinner, serving as executive chef while Le focused on management. Cinnamon rolls, quiche, and other baked goods fill a glass case at the front of the shop. In-house baker Sarah Dodge’s fluffy buttermilk biscuits, bagels, English muffins, and artisanal loaves provide a hearty base for sandwiches, avocado toast, and the signature Egg McMuff. Grain bowls, veggie plates, and rotating pasta dishes round out the day, ranging from $5 to $14. At 6 p.m., dinner service begins in the attached 40-seat dining room, anchored by a large communal table wrapped in copper. Vintage bureaus line the walls, holding Brown’s favorite cookbooks (Hugh Fearnley-Whittingstall, Fergus Henderson, Yoshihiro Imai), little spindly plants, cookies in a bell jar, a tabletop radio that could’ve been purchased across the street back when Ponce City Market was still Sears Roebuck. A black-on-white mural by local design guru Alvin Diec dominates one wall. Two hybridized animals — a crane/hawk and a snake/wolf — carry a bannered phrase in Latin: “Nulla enim servientes mercedem impii” or “no reward for serving the wicked.” It’s the moral of Aesop’s fable about a crane that retrieves a bone stuck in a wolf’s throat. Despite promised riches, the crane’s only reward is not getting eaten. Waitstaff shout orders through a window into the tiny kitchen, where chef Brown reigns. The menu changes nightly, and there’s no walk-in because nothing gets stored for more than a day or two. “The idea is: buy small and buy what’s good,” says Brown, who maintains close relationships with local farmers and urban foragers. In that spirit, 8ARM’s dinner menu features only eight dishes at a time, plus a few unlisted specials. The idea is that the entire menu provides the ideal amount of food for three people (or two really stoned people, notes Brown) to eat family-style and leave full. Plates get larger as you move down the list: four vegetable-forward items, two seafood dishes, one land animal, one fresh pasta. 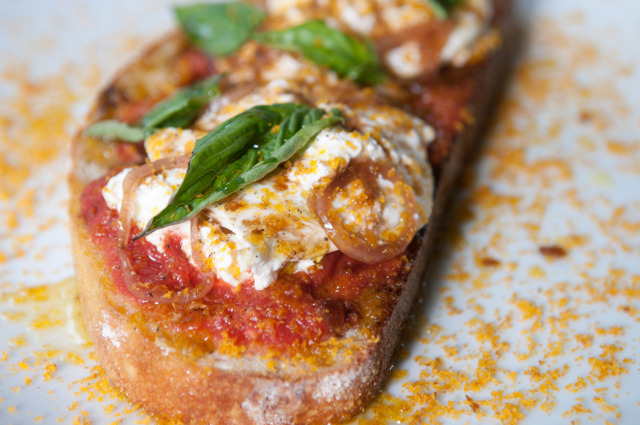 The only near-staple is burrata. “It’s one of my favorite things,” says Brown. “I’d been searching for a steady supply the whole time I lived in Atlanta; then I found a guy the week we opened.” Brown won’t reveal his source but says he’s served the Italian cheese 30 different ways in two months. On our visit, it arrived on fresh sourdough with sliced tomatoes ($15), topped with tangy ribbons of pickled shallot, fresh basil, and golden bits of bottarga (fish roe, salted and cured). It was exquisite; the pouch of mozzarella giving way to a velvety cream center, like biting into a rain cloud. Plates are smallish but shareable, priced for the quality of the ingredients, and healthy. As of this writing, 8ARM is BYOB, though that will change very soon, once the liquor license comes through. Then, the small outdoor patio will open, with a bar built from a repurposed shipping container painted white, its interior wallpapered with pink and purple florals. A half dozen John’s River oysters arrived on ice with thick homemade cocktail sauce ($20). Then came locally grown carrots cut lengthwise and sprinkled with sesame seeds sitting in a shallow pool of homemade Caesar ($9). Yellowfin ceviche ($16) was meaty and clean, seasoned with just a hint of locally foraged Flying Dragon bitter orange, wafers of avocado, and a crown of cilantro jeweled with trout roe. 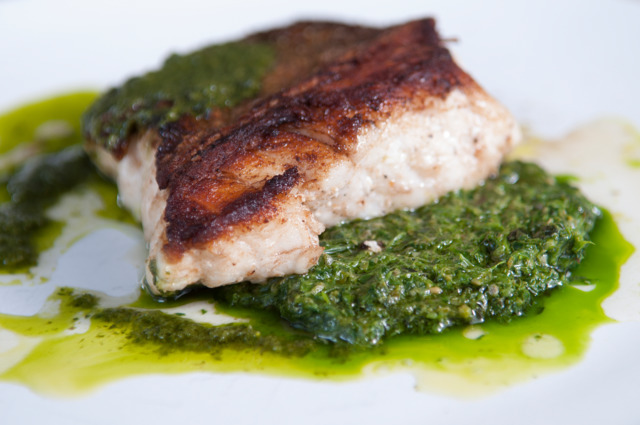 A small but plump cut of Florida grouper ($18), plated simply and sautéed to crispy-edged perfection, arrived with just a silky dollop of fresh salsa verde. Two Georgia quails sat primly atop a mini mountain of spaghetti squash and cubes of butternut, emboldened with earthy fontina, hot pepper, and sage ($24). For dessert ($7 — don’t skip it! ), vanilla ice cream came sandwiched between two hearty sea salt chocolate chip cookies. 8ARM. 710 Ponce de Leon Ave. 470-875-5856. http://www.8armatl.com/www.8armatl.com.